Check in time is 4.00 p.m. on the day of arrival. Please go directly to your rental property, there is a key box at the entrance door. The Reservation Deposit is 30 % from the Rent. The remaining Rent can be paid with the Credit Card or with check. Reservation Deposit, Damage Waiver, Travel Insurance fee and Reservation Fee + signed copy of this agreement is required to hold your Rental Property. Cancellations need to be made in writing. No refund from the Reservation Deposit if contract is canceled within 60 days prior your arrival. Half of the Reservation Deposit is refundable earlier than 60 days of your arrival. Remaining Balance is due 30 days prior to your arrival date. No refund of the Remaining Balance within 30 days of arrival. Private checks, cashier’s checks and wire transfers are payable to Vesteva Rentals & Property Management. Call the Office for bank wire information. Should the above Property be unavailable during the specified time due to unforeseen circumstances, including but not limited to, so called Acts of God, the Agent will try to provide a property of comparable quality and utility, which then becomes the property subject to this agreement, unless Guest requests a return of paid funds which in effect renders this agreement null and void for all parties. Owner and/or agent will not be held liable for any monetary damages above the refunded amount. Breakdown of premises equipment, i.e. air-conditioning, heat, appliances, pool-heater, etc. does not constitute grounds for any guest refund, so long as Owner makes repairs as soon as possible. 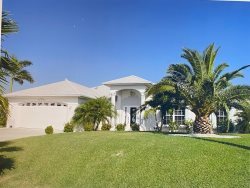 Cape Coral is a highly desirable area with lots of construction. We will not move guests due to construction or noise nor will there be a refund due to construction in the area. Any refund/discounts are at the discretion of the property owner. This Vacation Rental Damage plan covers unintentional damages to the rental unit that occur during your stay, provided they are disclosed to management prior to check-out. The policy will pay a maximum benefit of $ 1,000.00. Any damages that exceed $ 1,000.00 will be charged to the credit card on file. If, during your stay at one of our Rental Properties, an Insured Person – (anyone that is listed on the rental agreement) causes any damage to real or personal property of the unit as a result of inadvertent acts or omissions, the Insurer will reimburse the Insured for the cost of repair or replacement of such property up to a maximum benefit of $ 1,000.00. The Vacation Rental Damage Waiver is mandatory and included in the contract at a cost of $ 59.00 + 11.5 % Tax. By submitting the contract, you authorize and request Vesteva Rentals & Property Management to pay directly any amount payable under the terms and conditions of the Vacation Rental Damage. Guest may use the property strictly as a private vacation residence only, and no part of the property may use for any kind of trade, or business purposes by neither the Guest, nor family members, nor other guests. Guest must inspect Property within 24 hours after arrival and contact the Agent to communicate any per-existing damages, or file an objection or complaint. Should Guest fail to do so, Agent/ Owner will not be obligated to honor Guest` s complaint at a later time. On the day of departure, Guest must vacate the property and return it in proper condition and without any property damages to Agent/Owner. Check-out time is 10.00 a.m. Guest must use all appliances (refrigerator, TV, washer, dryer,) etc. and other technical installations and equipment of property with proper care and diligence. Should an appliance or technical installation work improperly, or be inoperable Guest must immediately inform Agent about this matter. Improper use of appliances and/or damages to these will be charged to the Guest. Guest confirms and understands that Property may not and will not be used for any kind of drug dealing activity, drug use and consumption, money laundering operations, organized crime or any illegal activity whatsoever. During the rental period, Agent/Owner reserves the right to enter the Property. Guest is obligated to keep the Property secure. At the time of arrival Agent will meet with Guest and explain all locks and security installations and proper use; all damages resulting from carelessness or misuse will be charged to the Guest. Pets are not welcome, unless Agent/Owner has approved them in advance and in writing. Smoking inside of the Property is generally prohibited. Should Guest violate either rule, Guest will be liable for any and all damages that may have been caused by such action and a contractual penalty of up to $ 1,000.00 will be charged. Guest is aware and understands that neither Agent nor Owner is /are responsible or liable for any of Guest´s personal property present on the property. Guest agrees to indemnify, defend and hold Agent and Owner harmless from and against any and all loss, damage or liability claims based on negligence (including, for the avoidance of doubt, gross negligence), action or inaction of the Agent and the Owner and their respective agents, representatives, employees and contractors, related to or arising in whole or in part from any damage, injury or death of the Guest or any other person occupying the property or present on the property. Guest and any other person occupying the property or present on the property accept all risks related to, but not limited to, the premises, swimming pools, pool equipment, whirlpools, canals, seawalls, docks, bicycles, other vehicles of any kind including boats and other watercraft, barbeques, fire places, technical and household equipment and appliances and any other equipment and installations which may be in or on the premises. This also applies if any of the aforementioned items are used outside the property. Guest and any other person occupying the property or present on the property or using the aforementioned items waive any claims against the Agent and the Owner and their respective agents, representatives, employees and contractors related to the above based on negligence (including, for the avoidance of doubt, gross negligence), action or inaction of the Agent and the Owner and their respective agents, representatives, employees and contractors. A waiver of legal rights, or the waiver of exercising legal rights by one party, due to breach of contract, is neither a waiver of, nor a waiver to exercise legal rights for a similar or different breach of contract. The failure of a party to either persecute a breach of contract, or to exercise its legal rights in one case, is not limiting the party`s ability to exercise legal rights, or to prosecute other breaches of contract, should these continue. Without prior approval in writing by Agent, Guest is neither allowed to transfer, nor to assign this agreement. In any Litigation that results from this agreement, the prevailing party is entitled to reimbursement of all costs, including all reasonable attorney`s fees (including all costs and fees for appellate procedures). In case that any part of this agreement should be declared void or invalid, this will not have any effect on other parts of this agreement, which can be in effect without the invalid terms; and therefore, the terms of this agreement shall be deemed separable. The laws of the State of Florida govern this agreement. The venue shall be Lee County, Florida. This agreement is binding on all parties, their heirs, successors, representatives and legal successors. Only the English language version of this agreement is legally binding. A supplied translation of this agreement, if applicable, is only for information purposes. If the Sales or Tourist tax went up after the contract was signed, the tenant is responsible to pay the additional amounts, due to the Florida State (Sales Tax) or Lee County (Tourist Tax) laws. More than the number of persons agreed upon in the rental agreement inhabiting the premises. Violations of any federal state or local laws and/or ordinances by guests, at any time, while on the premises. Electric usage included in the rental Rate is $ 75.00 per week. Any overage will be charged with $ 0.12 per kWh + Tax. Pets are only allowed in the pet friendly Homes. An additional pet fee of $120.00 + 11.5 % Tax will apply.